The late Great Keith Moon, The drummer with English rock group The Who, sadly pssed away on 7 September 1978. Born 23 August 1946, Moon grew up in Wembley, London and took up drumming in the early 1960s. After performing with local band The Beachcombers, he joined The Who in 1964, before they had recorded their first single. He stayed with the band during their rise to fame, He occasionally collaborated with other musicians, and later made appearances on radio and film,Moon took lessons from one of the loudest contemporary drummers, Screaming Lord Sutch’s Carlo Little, at ten shillings a time. Moon initially played in the drumming style of American surf rock and jazz, with a mix of R&B, using grooves and fills of those genres, exemplified by the noted Los Angeles studio drummer Hal Blaine. But Moon played faster and louder, with more persistence and authority. Moon’s favourite musicians were jazz artists, particularly Gene Krupa, whose flamboyant style he subsequently copied. He also admired DJ Fontana, Ringo Starr, and The Shadows’ original drummer, Tony Meehan. As well as drumming, Moon was interested in singing, with a particular interest in Motown. One band Moon notably idolised was The Beach Boys. During this time, Moon joined his first serious band, The Escorts, replacing his then best friend, Gerry Evans. In December 1962, he joined The Beachcombers, a semi-professional London cover band who played rock’n’roll and hits by groups such as The Shadows. ]During his time in the group, Moon incorporated various theatrical tricks into his act, including one instance where he “shot” the group’s lead singer with a starter pistol. The Beachcombers all had day jobs, including Moon, who was working in the sales department ofBritish Gypsum. He had the most interest among the band members in turning fully professional, and thus in April 1964, aged 17 he auditioned for The Who, who were looking for a permanent replacement for Doug Sandom. The Beachcombers continued as a local covers band after his departure. Sadly Moon’s wild lifestyle began to undermine his health, music, and his reliability as a band member. During the 1973 Quadrophenia tour, at The Who’s debut US date in the Cow PalaceArena, Daly City, California, Moon ingested a large mixture of tranquillisers and brandy. In a 1979 interview, Townshend claimed that Moon had consumed Ketamine pills, while Fletcher claims he took PCP. During the concert, Moon passed out on his drum kit while the band was playing the song “Won’t Get Fooled Again”. The band stopped playing and a group of roadies carried Moon offstage. They gave him a shower and an injection of cortisone, then sent him back onstage after a thirty-minute delay. Moon passed out for good during the song “Magic Bus” and was again removed from the stage. The band continued without him for a few songs. Finally, Townshend asked, “Can anyone play the drums? – I mean somebody good”. A drummer in the audience, Scot Halpin, came up and played for the rest of the show. In the 1970s, Moon also suffered from a number of tragedies, notably the accidental death of his chauffeur, Neil Boland, and the breakdown of his marriage. He became addicted to drink, particularly brandy and champagne, and started to acquire a reputation for decadence and dark humour, giving him the nickname “Moon The Loon”. After relocating to Los Angeles during the mid-1970s with his personal assistant, Peter “Dougal” Butler, he attempted to make his only solo album, the poorly received Two Sides of the Moon. 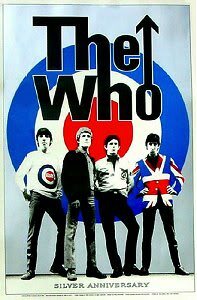 By the time of The Who’s final tours in 1976, and particularly during filming of The Kids Are Alright and recording of Who Are You, the gradual deterioration of his condition started to show, he blacked out on stage, and he was hospitalised on several occasions. Moon moved back to London in 1978, and died in 7 September 1978 after overdosing on Heminevrin, a drug designed to help curb alcohol abuse. When Cheshire went to Buckingham Palace to receive his VC from King George VI, he was accompanied by Norman Jackson who was also due to receive his award on that day. Cheshire insisted that despite the difference in rank (Group Captain and Warrant Officer), they should approach the King together. Jackson remembers that Cheshire said to the King, “This chap stuck his neck out more than I did – he should get his VC first!” The King had to keep to protocol, but Jackson commented he would “never forget what Cheshire said.” Cheshire was, in his day, both the youngest Group Captain in the service and, following his VC, the most decorated. In his book, Bomber Command (2010), Sir Max Hastings states “Cheshire was a legend in Bomber Command, a remarkable man with an almost mystical air about him, as if he somehow inhabited a different planet from those about him, but without affectation or pretension”. Cheshire would always fly on the most dangerous operations, he never took the easy option of just flying on the less risky ops to France, a habit which caused some COs to be referred to derisively as “François” by their men. Cheshire had no crew but would fly as “Second Dickey”, with the new and nervous to give them confidence. Cheshire had strong feelings on any crew displaying LMF (Lack of Moral Fibre, a euphemism for cowardice) when subject to the combat stress of Bomber Command’s sorties (many of which had loss rates of 5% or more). Even as a brilliant and sympathetic leader, he wrote “I was ruthless with LMF, I had to be. We were airmen not psychiatrists. Of course we had concern for any individual whose internal tensions meant that he could no longer go on but there was a worry that one really frightened man could affect others around him. There was no time to be as compassionate as I would like to have been.” Thus Cheshire transferred LMF cases out of his squadron almost instantaneously (like every other RAF squadron did at the time) This was also because he argued that a man who thought he was doomed would collapse or bail out when his aircraft was hit, whereas Cheshire thought if he could survive the initial shock of finding his aircraft damaged, he had more of a chance of survival. After the war, Cheshire lived with his wife Joan at the “VIP (for Vade in Pacem – Go in Peace) Colony” he established for veterans and war widows at Gumley Hall, Bedford Gardens – one of several new ventures he started after leaving the RAF in 1946. Joan followed him to Le Court, near Petersfield,Hampshire (a mansion which Cheshire had bought from his aunt) where, with three children of her own, Joan took charge of the nursery. Cheshire and Joan Botting subsequently investigated many religions, from Seventh Day Adventist to Methodist to “High Anglo-Catholic” – but none of them provided the answers they were looking for. Cheshire’s aim in establishing the VIP Colony was to provide an opportunity for ex-servicemen and women and their families to live together, each contributing to the community what they could, in order to help their transition back into civilian life. He hoped that training, prosperity and fulfillment would result from united effort and mutual support. He saw the community as one way of continuing to work towards world peace. The community, however, did not prosper and the project came to an end in 1947. In 1948, Cheshire heard about the case of Arthur Dykes, who had been one of Cheshire’s original “VIP” community at Le Court, and was suffering from cancer. Dykes asked Cheshire to give him some land to park a caravan until he recovered, but Cheshire discovered that Dykes was terminally ill and that this diagnosis was concealed from him. He told Dykes the real position and invited him to stay at Le Court. Cheshire learned nursing skills and was soon approached to take in a second patient, the 94-year-old bedridden wife of a man who had just been taken off to hospital after suffering a stroke. She was followed by others, some coming to stay and others to help. Although Le Court had no financial support, and his situation was financially perilous most of the time, money somehow always seemed to arrive in the nick of time to stave off disaster. Dykes died in August 1948. After completing the arrangements for his funeral, Cheshire idly picked up a book a friend had sent him. It was One Lord, One Faith by Vernon Johnson, a former High Anglican clergyman who, against every cherished instinct and prejudice, had converted to Roman Catholicism because, as he put it, “I could not resist the claim of the Catholic Church to be the one true Church founded by Our Lord Jesus Christ to guard and teach the truth … She alone possesses the authority and unity necessary for such a Divine vocation. In the meantime, Joan Botting had converted to Jehovah’s Witnesses. On Christmas Eve, 1948, Cheshire was received into the Catholic Church. The next day, Joan Botting and her children, Mavis, Gary and Elizabeth, moved out of Le Court for good. In 1949, eight patients were staying at Le Court.Six months later, there were 28. Cheshire dedicated the rest of his life to supporting disabled people, combining this with lecturing on conflict resolution.In 1948, Cheshire founded the charity Leonard Cheshire Disability, which provides support to disabled people throughout the world. It is now one of the top 30 British charities. Other organisations set up by Leonard Cheshire are:The Ryder-Cheshire Foundation,set up by Leonard Cheshire and his wife Sue Ryder at the time of their marriage in 1959. It now mainly operates in two fields: the rehabilitation of disabled people, through ENRYCH and the prevention and treatment oftuberculosis, through Target Tuberculosis. In 1953, Cheshire founded the Raphael Pilgrimage in order to enable sick and disabled people to travel to Lourdes.The Leonard Cheshire Disability & Inclusive Development Centre is a joint project by Leonard Cheshire Disability and University College London (originally set up in 1997 as the Leonard Cheshire Centre of Conflict Recovery).Cheshire founded the Memorial Fund for Disaster Relief, a UK charity in whose benefit the Roger Waters concert The Wall – Live in Berlinwas held. Cheshire opened this concert by blowing a Second World War whistle.Cheshire was also concerned about future remembrance and was influential in the concept of the National Memorial Arboretum, founded by David Childs. CHeshire sadly passed away 31 July 1992. However his legacy lives on And The amphitheatre at the National Memorial Arboretum in Alrewas is dedicated to the memory of Leonard Cheshire. The Blitz took place Between 7 September 1940 and 21 May 1941 during which there were major aerial raids (attacks in which more than 100 tons of high explosives were dropped) on 16 British cities. Called The Blitz (shortened from German Blitzkrieg, “lightning war”) it was the period of sustained strategic bombing of the United Kingdom by Nazi Germany during the Second World War. Over a period of 267 days (almost 37 weeks), London was attacked 71 times, Birmingham, Liverpool and Plymouth eight times, Bristol six, Glasgow five, Southampton four, Portsmouth and Hull three, and there was also at least one large raid on another eight cities. This was a result of a rapid escalation starting on 24 August 1940, when night bombers aiming for RAF airfields drifted off course and accidentally destroyed several London homes, killing civilians, combined with the UK Prime Minister Winston Churchill’s immediate response of bombing Berlin on the following night. Starting on 7 September 1940, one year into the war, London was bombed by the Luftwaffe for 57 consecutive nights. More than one million London houses were destroyed or damaged, and more than 40,000 civilians were killed, almost half of them in London. Ports and industrial centres outside London were also heavily attacked. The major Atlantic sea port of Liverpool was also heavily bombed, causing nearly 4,000 deaths within the Merseyside area during the war. The North Sea port of Hull, a convenient and easily found primary and secondary target for bombers unable to locate their primary targets, was subjected to 86 raids within the city boundaries during the war, with a conservative estimate of 1200 civilians killed and 95% of its housing stock destroyed or damaged. Other ports including Bristol, Cardiff, Portsmouth, Plymouth, Southampton, and Swansea were also targeted, as were the industrial cities of Birmingham, Belfast, Coventry, Glasgow, Manchester and Sheffield. Birmingham and Coventry were heavily targeted because of the Spitfire and tank factories in Birmingham and the many munitions factories in Coventry; the city centre of Coventry was almost completely destroyed. The bombing did not achieve its intended goals of demoralising the British into surrender or significantly damaging their war economy. The eight months of bombing never seriously hampered British production, and the war industries continued to operate and expand. The Blitz did not facilitate Operation Sea Lion, the planned German invasion of Britain. By May 1941 the threat of an invasion of Britain had passed, and Hitler’s attention had turned to Operation Barbarossa in the East. In comparison to the Allied bombing campaign against Germany, the Blitz resulted in relatively few casualties; the British bombing of Hamburg in July 1943 alone inflicted some 42,000 civilian deaths, about the same as the entire Blitz. Within hours of the UK and France declaring war on Germany on 3 September 1939, the RAF bombed German warships along the German coast at Wilhelmshaven. Thereafter bombing operations were against ports and shipping and propaganda leaflet drops. Operations were planned to minimize civilian casualties. From 15 May 1940 – the day after the Luftwaffe destroyed the centre of Rotterdam – the RAF also carried out operations east of the Rhine, attacking industrial and transportation targets. Operations were carried out every night thereafter. Although not specifically prepared to conduct independent strategic air operations against an opponent, the Luftwaffe was expected to do so over Britain. From July until September 1940 the Luftwaffe attacked RAF Fighter Command to gain air superiority as a prelude to invasion. This involved the bombing of English Channel convoys, ports, and RAF airfields and supporting industries. Destroying RAF Fighter Command would allow the Germans to gain control of the skies over the invasion area. It was supposed that RAF Bomber Command, RAF Coastal Command, and the Royal Navy could not operate effectively under conditions of German air superiority. The Luftwaffe’s poor intelligence meant that their aircraft were not always able to locate their targets, and thus attacks on factories and airfields failed to achieve the desired results. British fighter aircraft production continued at a rate surpassing Germany’s by 2 to 1. The British produced 10,000 aircraft in 1940, in comparison to Germany’s 8,000. The replacement of pilots and aircrew was more difficult. Both the RAF and Luftwaffe struggled to replace manpower losses, though the Germans had larger reserves of trained aircrew. The circumstances affected the Germans more than the British. Operating over home territory, British flyers could fly again if they survived being shot down. German crews, even if they survived, faced capture. Moreover, bombers had four to five crewmen on board, representing a greater loss of manpower. On 7 September, the Germans shifted away from the destruction of the RAF’s supporting structures. German intelligence suggested Fighter Command was weakening, and an attack on London would force it into a final battle of annihilation while compelling the British Government to surrender.